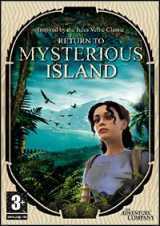 Inspired by Jules Verne's book The Mysterious Island, you play a young woman who is stranded on an uncharted island. Attempting to break a world record by sailing around the world by herself, Mina is washed overboard during a storm and manages to swim to a beach. She must learn to survive by finding food and shelter and will eventually find a way to explore the entire island. During her adventure, Mina stumbles upon a beautiful submarine .. Captain Nemo's Nautilus. The game features a non-linear storyline and a unique inventory management system. The majority of its puzzles are inventory object related and have multiple solutions. Readers of Verne's book will recognize the locations and characters in the game. Achievements are logged with points, reminiscent of older Sierra games.